Diana speaks about Jovylyn’s work on a novel BRD9-containing complex at the 2018 International Symposium: Epigenetic Control and Cellular Plasticity at the Center for Epigenomics and Metabolism at the University of California, Irvine. Fangjian, Jovylyn, Jawoon, and Josephine also attend to hear fantastic talks from several giants in the field. Fangjian and Jovylyn present posters at the Cell and Gene Meeting on the Mesa. Jawoon presents a poster on her work with Josephine on the role of ARID1A in inflammation at the La Jolla Immunology Conference. 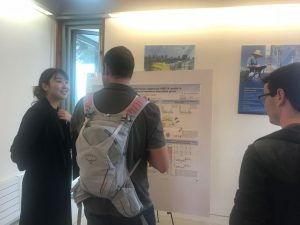 Jovylyn, Fangjian, and Jawoon present posters at the Salk by the Seaside Retreat. Fangjian wins the Minute to Win It! Diana speaks at the Cold Spring Harbor Laboratory Epigenetics and Chromatin meeting on Jovylyn’s work about a novel BRD9-containing complex controlling embryonic stem cell pluripotency. Diana spends a great day with students after speaking at the Biochemistry and Biotechnology Symposium on Drug Discovery, hosted by the University of Missouri-St. Louis. Diana receives the R35 Maximizing Investigator’s Research Award from the NIGMS/NIH! Here’s to another 5 years of fantastic research! 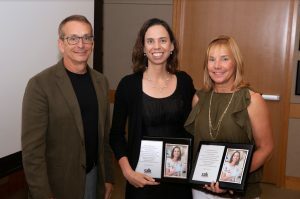 Diana is awarded the Richard Heyman and Anne Daigle Endowed Developmental Chair. 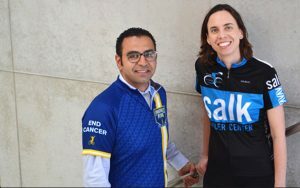 Diana receives the Padres Pedal the Cause/C3 Collaborative Translational Cancer Research Grant for her collaboration with Dr. Ramez Eskander of Moores Cancer Center (UCSD). 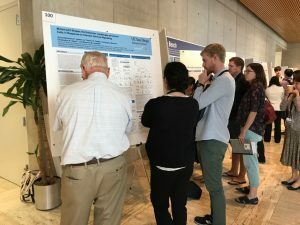 Nick Elliot presents a poster at the International Society for Stem Cell Research Annual meeting in Melbourne, Australia on his research with Fangjian studying the role of BRM missense mutations in intellectual disability. Congratulations to Jovylyn Gatchalian, who was awarded the F32 Ruth L. Kirschstein National Research Service Award (NRSA) Individual Postdoctoral Fellowship from the NIH! Kudos to her for her hard work and grantsmanship! 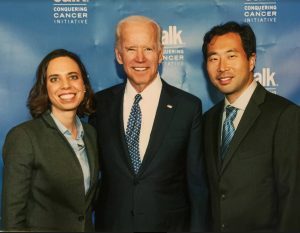 Former Vice President Joe Biden speaks at Salk to launch our Conquering Cancer Initiative! 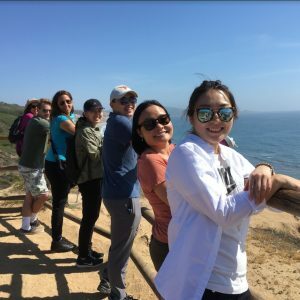 More fun with a lab outing at Torrey Pines State Park! Diana presents at ‘Small Molecules for Cancer Immunotherapy’, a Drug Discovery Chemistry event in San Diego, CA. 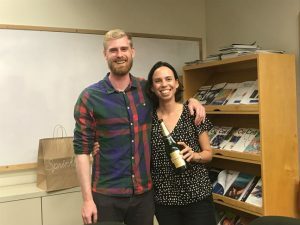 Welcome to Julieta Tesone, postdoctoral trainee, who completed her Ph.D. in Dr. Conejo-Garcia’s lab at the Wistar Institute in Philadelphia, PA.
Congratulations to Shivani Malik for accepting a position at Ionis Pharmaceuticals! We wish you well! Shivani’s last day—we wish you all the best in your new position at Ionis Pharmaceuticals! Welcome to Jawoon Yi, our new research associate, who joins us from the Korea National Institute of Health. We are looking forward to great science and your homemade Jajangmyeon! Diana presents at the University of California, Irvine Epigenetics Day. 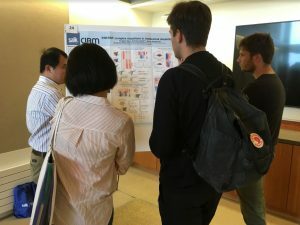 Diana gives a talk and Fangjian presents a poster at the Cell and Gene Meeting on the Mesa. New paper published in eLife! Congratulations to Timothy Kelso and Devin Porter on the acceptance of their paper to eLife describing the synthetic lethality of SWI/SNF subunits! Get ready for the annual Padres Pedal the Cause fundraiser! Please consider donating to support the Salk Cancer Team! Jovylyn Gatchalian is selected for a T32 training fellowship through the Salk Institute Cancer Institute! Congratulations, Jovylyn! Great time interacting with colleagues and friends at the bi-annual Mechanisms and Models of Cancer! Welcome Nick Elliot from the CIRM Bridges to Stem Cell Research Internship Program! We are delighted to partner with the San Diego State University to train the next generation of stem cell scientists! Welcome Josephine Ho, master’s graduate from Wesleyan University! Welcome Shivani Malik, a visiting collaborator from University of California, San Francisco! Fangjian has a baby boy—welcome to the world, Dylan! 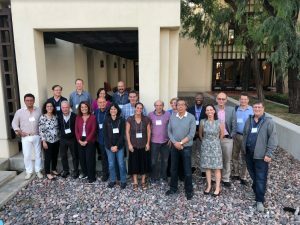 The San Diego Chromatin Club organized by Bing Ren (UCSD), Ani Deshpande (Sanford-Burnham), Diana Hargreaves (Salk), and Chris Benner (UCSD) kicks off its inaugural meeting! Diana has a baby boy—welcome to the world, Gabriel! Fangjian is awarded the Salk Pioneer Fund Postdoctoral Fellowship! 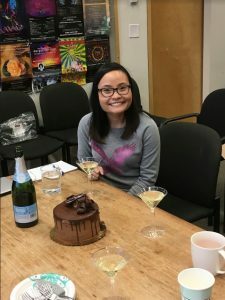 Jovylyn Gatchalian starts her postdoctoral work in the lab!